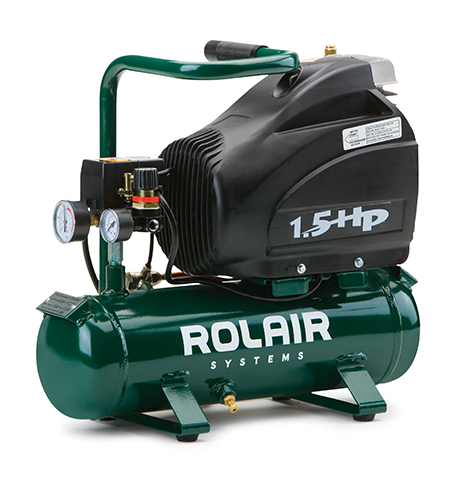 Model FC1500HS3 features a handle centered above the motor-pump and low-profile tank, making it easy to carry. It produces 4 CFM @ 90 PSI and weighs in at a minimal 39 lb. ROLAIR Quality, Single Stage, Ball Bearings, Cast-Iron Cylinder, Stainless-Steel Reed Valves and Splash Lubrication Ensure Longer Life. 1.5 HP, 3400 RPM, Low-Amp Draw, Overload Protection with Manual Reset, 115 Volt, 60 Hz, Heavy-Duty/Industrial-Grade with Ball Bearings for Greater Durability. PUMP OIL CAPACITY 6 oz. L x W x H 20"x 9"x18"